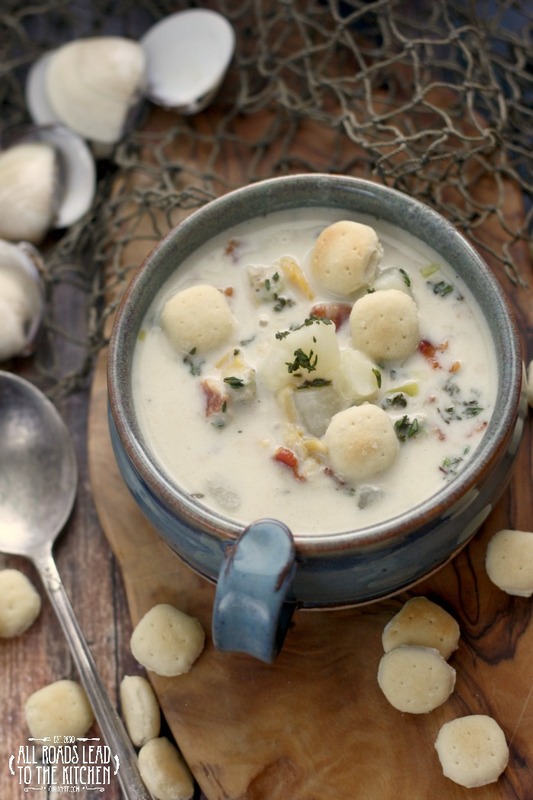 Here's a little not-so-secret fact about me - I love clam chowder. 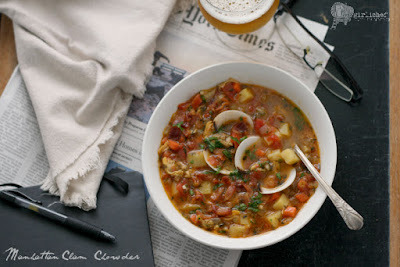 You may even know that the very first recipe I ever posted on my blog was Manhattan Clam Chowder. Last year I did an updated recipe and post about it around my 6-year blogging anniversary. 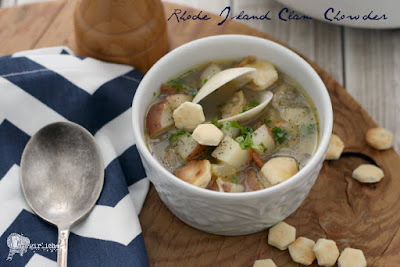 I've also shared a recipe for Rhode Island Clam Chowder. 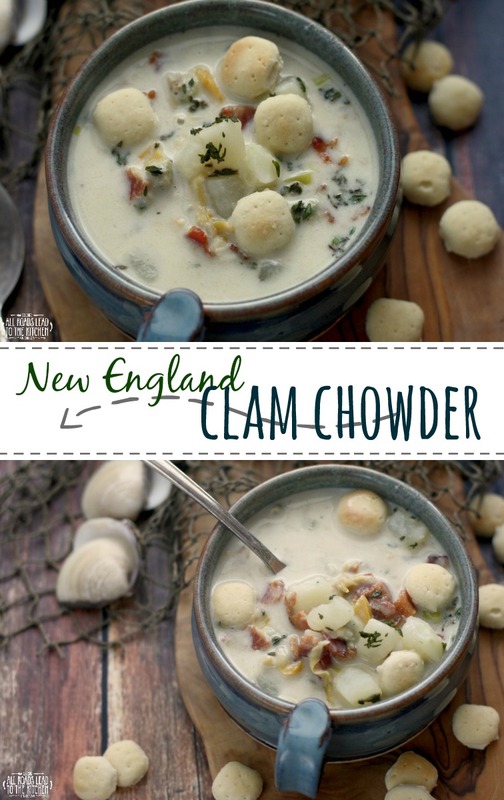 But, believe it or not, this is actually the first time I'm sharing a recipe for the classic, creamy New England version that everybody seems to think of first when they hear the words clam chowder. Now, don't hate me New Englanders, but Manhattan is actually my favorite kind (and I can't stand the Patriots). I do enjoy the rich white chowder from time to time, though. I think I might have mentioned going on a quest to try as many types of clam chowder as I could get my hands on last year. But I must have forgotten about it, because I never did it. Maybe this will be my year. 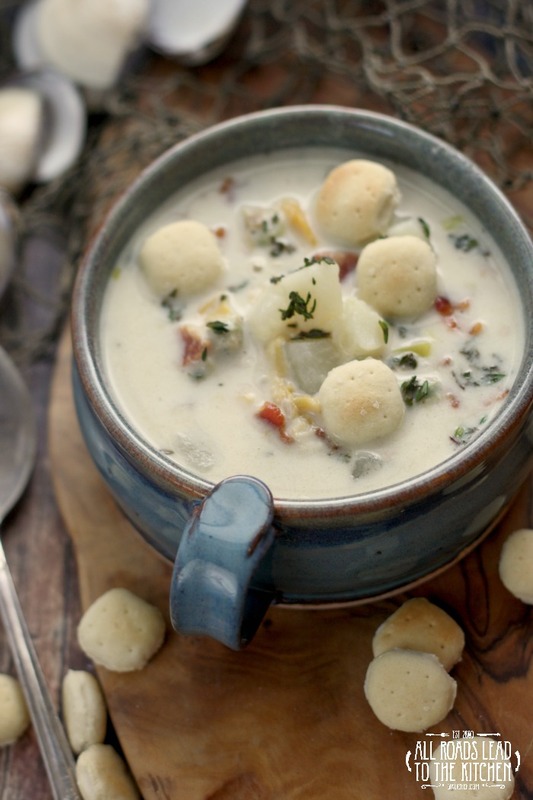 I think today is the perfect starting point, seeing as it's actually New England Clam Chowder Day. No joke! This version is pretty traditional, although I've heard some people argue that there is no bacon in traditional NE-style. So you can leave the bacon step out if you really want to. Substitute some butter or oil for the grease that you saute the veggies in. That's cool — you do you. Just celebrate the day with a steaming bowl and all will be well with the world. 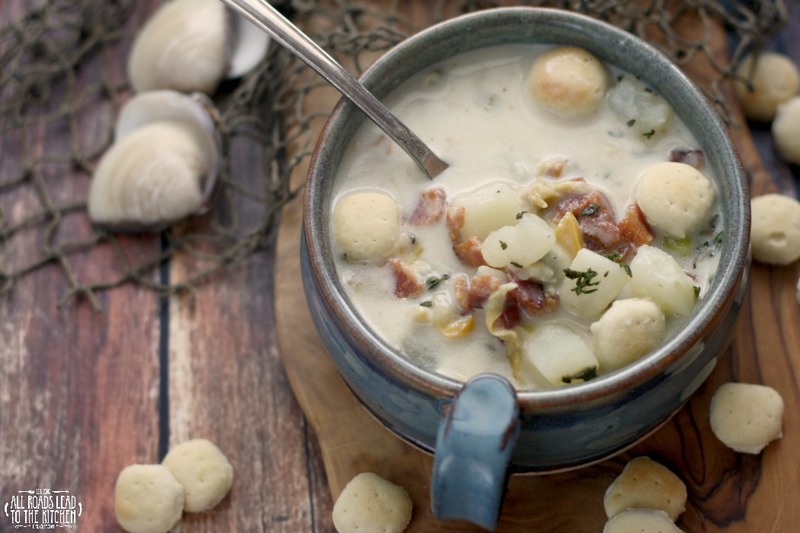 Rich, creamy and loaded with clams, this classic New England Clam chowder recipe will warm your bones and comfort your soul. Put the bacon into a heavy 4-quart pot over medium heat. Cook until the bacon is done, stirring as you go, 8-10 minutes. Drain off all but about 2 tablespoons of the bacon grease. If you want, you can lift out the bacon and save it to stir in at the end, leaving the fat behind; or just leave it in now. Add celery, onion, and garlic and cook, stirring often, until onion is soft, 5-7 minutes. In the meantime, open the cans of clams and drain the liquid into a small bowl; reserve clams for now. Add stock or broth, clam juice (both the amount in the ingredient list and what was drained from the cans), potatoes, thyme sprigs, and bay leaf. Bring to a boil, then reduce heat to a steady simmer and cook until potatoes are tender, ~15 minutes. Stir cornstarch and 2 tablespoons of cold water together in a small bowl until dissolved. Stir into chowder pot and return to a simmer until it has thickened up a bit, 1-2 minutes. Turn the down as far as it will go, then lift out the bay leaf and thyme stems and discard. Stir in the reserved clams and the cream and cook until the mixture starts to steam again and everything is heated through. Taste and adjust seasoning with salt and pepper as needed (but really, taste it first - salt varies in stock/broth, bacon, and clam juice). 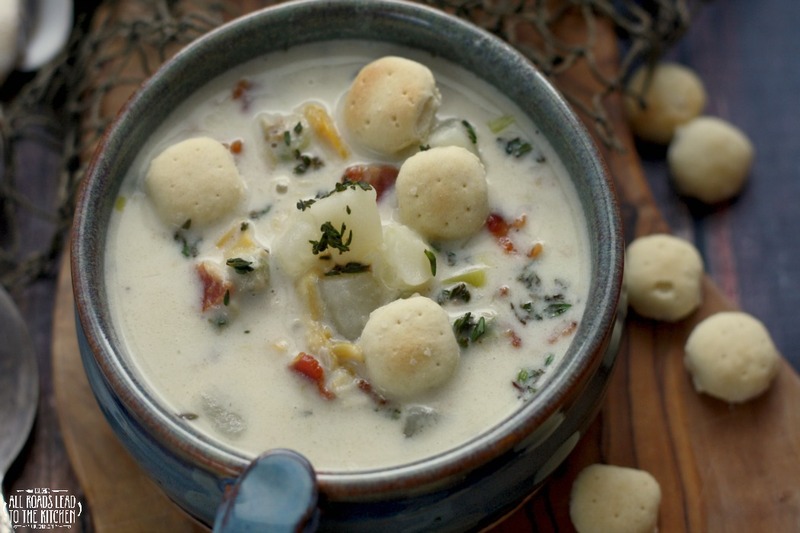 Divide chowder among bowls (add the bacon back if you reserved it in the beginning). Garnish with oyster crackers and a few scattered fresh thyme leaves.